Most people go to work, get a paycheck, and spend it. Not you. If I've got you pegged right (and I'm pretty sure I do), you've got more ambition than that. A lot more. And you're smarter than that. A lot smarter. Good for you. As we used to say back in Brooklyn, that and 90 cents will get you on the subway. Don't tell me how much it costs now; I don't want to know. In all seriousness, brains and ambition is a pretty good start to launch a career, but it's not enough, not by a long shot. You see, there are lots of things in the corporate world that affect you, but you've got to know how to read the tea leaves. Everyone has moderately good things to say about you. What it means: You're going nowhere. I know that sounds harsh, but it's true and here's why. Stars get ahead, moderate performers don't. Even if you think you're a star, if the powers that be don't agree, guess who gets to make the call? Right, not you. What you should do: Ask questions. Go straight to your boss, your bosses, your peers, whoever, and ask them straight out how you can improve, what you can do to get from good to great. Above all, don't be defensive and make them sorry they were honest with you. Your boss says great things about you but you're still passed over for raises and promotions. What it means: He's sugarcoating the truth, probably because he's a wimpy boss who doesn't want to be the bad guy and doesn't have the guts to do the right thing and tell you straight what's going on. What you should do: Same as above except ask, "What do I need to do to get promoted around here?" Again, be direct but remember that the guy clearly doesn't do confrontation, so be nice about it. Your boss has given you the same negative feedback more than once. What it means: You're not listening. You may think you're listening, but you're really not or you just don't want to hear what she's telling you. What you should do: Listen. Ask leading questions like, "How can I do better?" If you disagree with the feedback, that's fine. It really doesn't matter. Just remember that she's still the boss, so at the end of the day what she says goes. 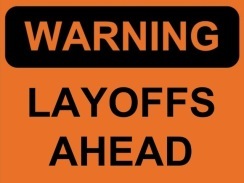 There are layoffs at your company. What it means: Unless it's a one-shot deal where there's a market correction and the company cuts just once and deep, it's a really bad sign. Yes, I know we live in a time when layoffs are common, but they're not nearly as common at consistently good, healthy, growing companies. And those are the kind you want to work for. What you should do: You may not have gotten axed this round, but that doesn't mean it won't happen down the road. It's probably a good idea to update your resume and LinkedIn profile and start networking a little more aggressively. Don't panic and bolt -- you might get a half decent termination package. Just be prepared. Lots of good people are jumping ship. What it means: Occam's Razor says the simplest answer is usually the correct one. If lots of good people are jumping ship, it's either sprung a leak or there's an iceberg up ahead. What you should do: Start by asking one or two of your exiting colleagues what they know that you don't. If that's not possible, then you know the drill: fire up your resume and start networking – now. Everything is a deep dark secret. What it means: When everyone's walking around tight-lipped, guarded, or suspiciously paranoid, bad things are afoot. If your company's always been like that, then it's dysfunctional, which is even worse. What you should do: Unless you work for, say, Apple (AAPL) or Trader Joe's, where secrecy is part of the culture, it's time to update the resume again. What it means: These days it's popular to question the relentless capitalist drive toward growth and profits. Let me tell you, that's just a bunch of Utopian garbage from people who are clueless about how business really works. If your company isn't growing, it's stagnating. If it's stagnating, then the market is passing it by. And that's just a slow, painful death spiral. What you should do: Now that you know you're not on a rocketship to the stars, it's probably time to get out there and start looking around for a company that's actually going somewhere. Your company isn't making money. What it means: One or two quarters in the red is no big deal. But if it's consistently up and down, that's a sign management doesn't know how to run a company or that the company's products aren't cutting it. Speaking of, if your company isn't at least No. 1 or No. 2 in the markets it serves, that's also a bad sign. What you should do: Losing money doesn't necessarily mean it's a bad place to work. Depending on the balance sheet -- cash, debt, and all that -- companies can go for years and years without going under. But if they start cutting corners and perks, don't say I didn't warn you.